A group of four persons had left the canoe in which they had been traveling and walked toward a small rise of ground. From this rise they could look at the country around them. For miles and miles on every side, the fresh green forest stretched out like some great ocean. Yet not far distant, and in the same direction they were traveling, a small column of smoke was seen rising into the air. toward it, in order to find out who might be located there. The group was on its way to the English fort at Oswego on Lake Ontario. They had been traveling for more than a week by means of the river trails that led west from Albany. In only one or two more days they would be able to reach the fort, but they knew that they were now in a more dangerous section of the country than that which they had just left. The French and the English were at war at this time over possession of the American colonies. Enemy tribes of Indians, working with the French, were on the warpath in these very woods. Two men and two women made up the group. From their general appearance they seemed to be persons of simple man­ners and habits. Two of them, a man and his wife, belonged to the people who were the original inhabitants of these forests. They were Indians of the well-known tribe of the Tuscaroras. The man, whose name was Arrowhead, was serving as a guide to the party; his wife, Dew-of-June, simply accompanied him. Their two white companions were a Mr. Charles Cap, and a young woman, Mabel Dunham, his niece. Mr. Cap looked like a man who had spent his days on the ocean and was clearly an ordinary seaman. His niece Miss Dunham was a girl of per­haps twenty years of age. Despite her apparent youth she ap­peared to be a person of character and intelligence. Her face was definitely pretty, though her expression at the moment was serious. The idea that other people, completely unknown, were somewhere near them in this wild and savage forest, had caused her cheeks to grow red with excitement. After about a half-hour’s walk, three of the party were near­ing the so-called paleface fire. Dew-of-June had returned to wait in the canoe on the river. From the moment they had first viewed the rising smoke, seaman Cap had brought out his pocket compass, which he considered very necessary to lead them through the thick forest. The Indian guide Arrowhead, however, simply noted the general direction with his eye and led them directly to the place without difficulty. His step be­came suddenly lighter as voices could be heard not far distant. “Palefaces—two,” said Arrowhead, holding up two fingers, “redman—one.” And he held up one finger. “Palefaces,” said Arrowhead again, holding up two fingers, “redman,” showing but one. “Redman, Mohican,” said Arrowhead. “Palefaces, Yankee.” “That is good news,” said Mabel, who had no wish to meet with those who might turn out to be deadly enemies. “Let us go up to them at once, dear uncle, and show ourselves as friends.” “Let the girl go alone,” said the Tuscarora. 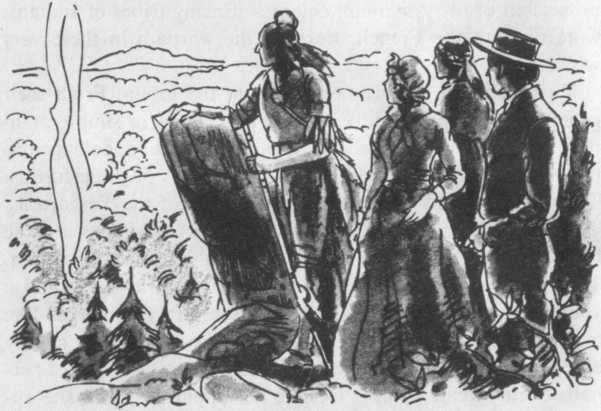 After some final directions from Arrowhead, Mabel moved ahead towards the group before the fire. Although her heart beat quickly, her step was sure and her face showed no fear. The men toward whom she walked were so busy eating their evening meal that at first they did not notice her approach. But when Mabel was within about a hundred feet of the group she stepped upon a dried stick. The slight noise caused the Mohican (for it was a Mohican, just as Arrowhead had said) and his companion to rise quickly to their feet. Both men looked toward their guns which leaned against a tree. Then, as their eyes fell on the young girl, they stood without moving. The Indian spoke a few words to his companion, sat down again, and went on eating as calmly as if nothing had happened. The white man, however, left the fire and came walking toward Mabel. Mabel saw, as the stranger approached, that he was a white man, though his dress was so strange, and so similar in some ways to that of an Indian, that it was necessary to look at him closely to be certain of this. He was a man of about middle age. Though not at all good-looking, his face had such an honest and pleasant expression, that Mabel felt at once that she had nothing to be afraid of. Still, she stopped and waited. A. 1. How many people were there in the group that was traveling through the forest? 2.What could they see from the rise of ground where they stopped? 4.How long had they been traveling? How much longer would it take them to reach the fort? 5.Why was it dangerous to travel at this time? 6.Who were the two Indian travelers? 7.Who were the two white travelers? What were they like? 8.What did Cap use as a guide through the forest? What did Arrowhead use as a guide? 9.How did Arrowhead know that the fire had been made by whites? 10.How many men were in the group around the fir&? How many were Indians according to Cap? How many 11.were Indians according to Arrowhead? 12.Why did Mabel go ahead alone? 13.What made the men aware of her presence? 14.Who was the man who came forward to meet her? Was he white or Indian? These words were spoken simply. It was clear from his man­ner that he knew that by whatever name he was known, he had no reason to be ashamed of any of them. Mabel was greatly excited. The moment she heard the name Pathfinder, she ran up to him, calling him by that name. “Then you are the friend my father promised to send to meet us,” Mabel said. “It is, then, perhaps fortunate we have met,” said Mabel. “You are right. In any case, I promised the sergeant, your father, that I would see his child safe to the fort, though I had to die for it. We expected to meet, you before you reached the Falls, where we left our canoe, and so we thought it might be best to come up a few miles in order to help you if you needed us. It is fortunate that we did, because I doubt whether Arrow­head is the man to take you through the dangerous Falls.” “Here come my uncle and the Tuscarora now,” interrupted Mabel. As she said this, Cap and Arrowhead, who saw that the conversation was friendly, came close. After a few words of explanation from Pathfinder, they went toward the two men who had remained near the fire. The Mohican continued to eat. The second white man rose politely and took off his hat. He was young, with a very pleasant, good-looking face. He wore clothes somewhat similar to those of Mabel’s uncle, as if he too had some connection with the water. When Mabel looked at the young man she saw his admiration for her in the expression on his face, so that she had to turn away. In fact, each felt at once that same interest in the other which two young people of similar age might natur­ally show under such circumstances. While Pathfinder spoke, the two Indians looked at each other steadily, and the Tuscarora approached and spoke to the other in a friendly manner. “Uncle, is there not more or less land all around the ocean?” interrupted Mabel, fearing that the old seaman would go on speaking about this, his favorite subject. Charles Cap said much more than he supposed. Jasper Western was only too glad to take care of Mabel, and paid her every possible attention. Mabel long remembered his kind and pleasant manner. He arranged a comfortable place for her to sit and brought her food to eat and water to drink. He soon won a place in her affection by his gentle, pleasant way of showing his interest in everything that concerned her. Mabel liked his simple, honest way of speaking and found him attractive in appearance. She listened carefully as he told her about her father, whom she had not seen since she was a child. He de­scribed the yet distant place to which she was traveling, and the manner of life that she might expect to find at the fort. The rest of the group, meanwhile, had taken their places around the fire and were now eating with apparent pleasure. The Indians remained silent, but Cap and Pathfinder talked with interest about matters that concerned them both. Cap was not long in expressing himself about the advantages of the sea­man’s life over all others; but he also listened carefully as Path­finder told him of Indian ways, of life in the forest, and of the dangers of travel where certain of the tribes were helping the French to fight against the English and the people of the colonies. The afternoon wore on. There remained only a few hours of daylight. Pathfinder soon made ready to leave, and the others followed his lead. As they were about to start, Pathfinder got together a number of branches and threw them upon the dying fire, taking care to see that some of the wood was wet, in order to raise as dark and as heavy a smoke as possible. Jasper laughed, showing that he agreed with the plan. Then the subject was dropped, for they were now nearing the place where the canoe in which Mabel, Cap and Arrowhead had traveled, waited for them. A. 1. Why was Pathfinder’s name familiar to Mabel? 2. Why didn’t Pathfinder think much of Arrowhead? 3.Why did he think it was fortunate that they had met now? 4.Who were Pathfinder’s two companions? 5.Where had Jasper Western spent most of his life? 6.What did Cap like to talk about? 7.Why did Jasper quickly win a place in Mabel’s affections? 8.What did Cap and Pathfinder talk about? 9.Why did Pathfinder throw water on the fire? 10.Why did he think that the Indians wouldn’t be able to follow them? 11.What did Pathfinder and Jasper plan to do with Cap? Why?